The paleo diet, also known as the Stone Age or cavemen diet, has been gaining popularity recently as a way to help individual lose weight, with an ever increasing need for alternative paleo snack ideas. The concept is simple. Since cavemen weren’t overweight, humans today should consume the same food that their ancestors did. Since cavemen didn’t have high blood pressure, cholesterol, or diabetes, the theory is that the diet will help users shed unwanted pounds while also becoming more healthy in the process. Unfortunately, that’s not always that easy. The cavemen consumed a high level of protein that’s almost impossible to achieve normally. Even for those who are able to reach the recommended levels, the price can add up quickly. Even worse, most protein supplements that could be used to help dieters are loaded with artificial flavoring, colors, or other chemicals, none of which were consumed during the Stone Age. Fortunately, 180 Nutrition is dedicated to providing their customers with an all natural protein powder that can be used in any diet. While the powder isn’t specifically designed for the paleo diet, it meets all the requirements. Everything in the powder is all natural and there’s only 12 ingredients, none of which are chemically altered. These ingredients include grass fed whey, flax seed, almond meal, sunflower kernels, coconut flour, cocoa flavoring, chia seeds, pumpkin seeds, sesame seeds, psyllium husk, inactive brewers yeast, and stevia. While the protein supplement can be blended to create a vegetable or fruit smoothie, that’s not the only paleo snack that can be made. The powder can also be cooked with or added to other meals to help increase the amount of protein the food contains. For those who aren’t natural chefs, that’s okay too. 180 Nutrition has dozens of easy to follow recipes on their website. These recipes include everything from paleo snacks to meals that can be made in less than three minutes. While most people assume that paleo snacks have to be meat, veggies, or nuts, that’s not the case when using 180 Nutrition’s protein powder. The paleo diet means that users must limit their sugar intake level. This can lead to unbearable cravings that can wreck the entire dieting process plan. 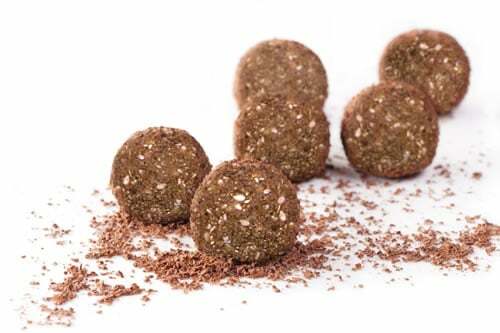 180 Nutrition understands that users may crave something sweet instead of the same boring meat or nut products, and that’s why they’ve created several great tasting, yet still all-natural, paleo snacks. Some of the most popular include high protein chocolate chip cookies and high protein blueberry muffins. Both recipes are easy to follow and can be made with just a few ingredients. Since the paleo diet doesn’t allow white flour, almond flour and protein powder are used instead. This results in a very tasty and very healthy snack that all ages can enjoy.